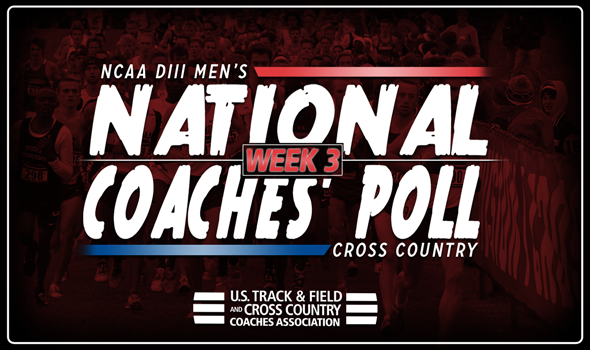 NEW ORLEANS – We hope teams in the top-10 of the NCAA Division III Men’s Cross Country National Coaches’ Poll didn’t get too comfortable, because the winds of change swept through the index after two exciting weekends. Four teams found new spots in the top-10 of the most recent poll released Wednesday by the U.S. Track & Field and Cross Country Coaches Association (USTFCCCA). North Central (Ill.) and SUNY Geneseo sit No. 1 and No. 2 and don’t appear to be budging from those spots for a long time. This is the 65th time in program history that the Cardinals have been No. 1 in the poll, while the Knights solidified their spot behind them with a winning effort at the loaded Purple Valley Classic this past weekend. Johns Hopkins moved up two spots from No. 5 to No. 3 despite not racing and notched its best ranking in program history. The Blue Jays last raced at the Paddy Doyle Meet of Champions and impressed while doing so as they finished fourth and beat several NCAA Division I teams. Pomona-Pitzer is back in the top-5 for the fourth time in program history at No. 5. Even though the Sagehens were idle like Johns Hopkins, they moved up thanks to their performance two weeks ago at the UC Riverside Invitational (fifth place among non-NCAA DI programs). RPI vaulted into the top-10 at No. 7 and that’s its best billing in program history. It was at the Purple Valley Classic this past weekend where the Engineers gave SUNY Geneseo all it could handle and fell just short of the upset. Grant O’Connor and Sean O’Connor went 2-3 for RPI, but depth allowed the Knights to squeak out an 87-95 win. Amherst comes in at No. 8 and like RPI, fared well at the Purple Valley Classic. The Mammoths placed a distant third and put three runners in the top-15 led by sophomore Clark Ricciardelli (fourth, 26:11.9) and Mohamed Hussein (sixth, 26:14.2). Further down in the poll, Calvin and Albion worked their way up and back into the poll, respectively, after their efforts at the MIAA Jamboree. The 12th-ranked Knights won going away (47 points with six in the top-10), while the 27th-ranked Britons finished second with 47 points. Be sure to check back throughout the season, because you’ll see a lot more movement between now and November 14 when the final NCAA Division III Men’s National Coaches’ Poll is released in advance of the 2017 NCAA Division III Cross Country Championships.